CELEBRATION FOR AELFTHRYTH, SHIPTON VILLAGE HALL, 9 FEBRUARY 2013. As many of you will know, Aelfthryth and I have over the years organised many different kinds of parties and gatherings -- four years ago in this hall. And it seems very strange that I have had to organise this event without her being here although you will not be surprised to hear that I haven’t done so without her approval. In fact all the items on this programme were specified by Aelfthryth before she died and in some detail. It has been my task to arrange them and I am very grateful to all the musicians and speakers who have agreed to take part. I would also like to thank Lee, the manager of this hall, and Caroline, the manager of the catering, for all their help too, and I would\ like to thank all of you for coming to this celebration. It is a great tribute to Aelfthryth that so many of her relatives and friends are here today. It is impossible to sum up half a century together, 53 years to be precise, But I would just like to share with you two or three thoughts about us together and about Aelfthryth herself. First I would like to tell you how we first met properly. We met in a hall in Oxford, where Aelfthryth and I had been given the task of organising a CND exhibition to commemorate Hiroshima Day.And together in that meeting room one can say that we clicked. We clicked both personally and politically, and we would continue to do so throughout our years together in both, equally important spheres of human life. Second, quite a few of you in your messages have said that we made a good team together, and looking back in the last few months, Aelfthryth and I came to the same conclusion, that we had embarked on a great enterprise, not always quite knowing where we were going, and that it has been a great success/ One of the photo panels exhibited here is labelled Cats and Boys, and at times it seemed as if this enterprise was mainly concerned with bringing up and looking after Cats and Boys, but it was a lot more than that. Aelfthryth managed to re-start her working career while she was still pregnant with Max: she also managed to sustain me in my own work in a generous and unselfish way. Third, I would like to just enumerate some of the things which Aelfthryth enjoyed, some of the things which she loved. She enjoyed giving parties, especially in recent years on the mulberry lawn at Shipton Court, and cooking delicious food with great skill and attention to detail. She enjoyed doing crosswords and was better at them than anyone else in the family. She enjoyed keeping things straight, whether it was the contents of the Gatehouse, or the files and folders of the Oxfordshire and Wychwood Probate Groups. She enjoyed chatting and laughing == quite a lot of these at meetings of both of those groups. She loved visiting churches, abbeys and cathedrals, and she had a particular taste for the Norman and the Gothic. But most of all, she loved her own children and grand-chlldren, and she loved the children of many others. Finally, a word about the photo panels on display here. I have not tried to label everything, but do please look at them and if you have any questions about them please ask myself or Danny, or Tom or Joe or Max. Right now, I would just like to draw your attention to one remarkable feature which I have noticed while putting them together. 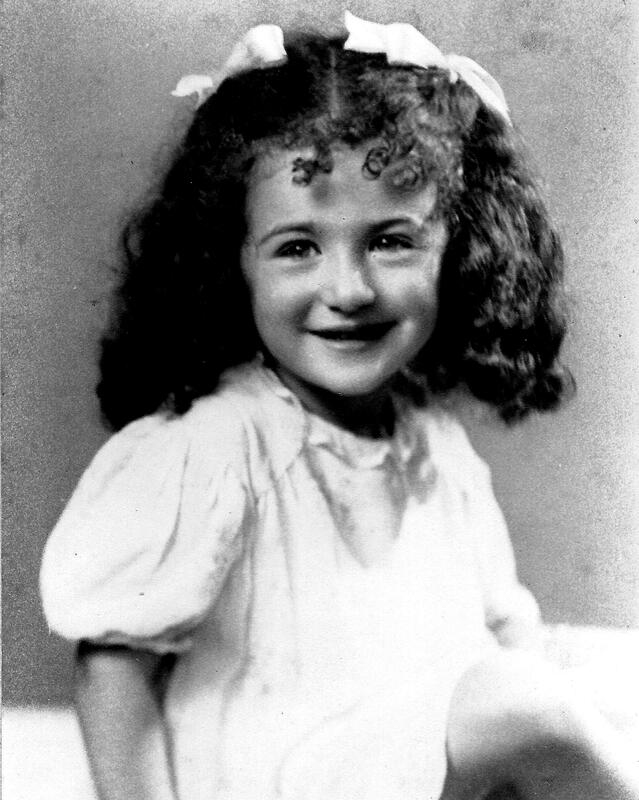 Please look at the very first photo in the sequence, a photo of Aelfthryth at the age of four in 1943, with a smile on her face. Then look at the photos in recent years, more than 60 -- nearly 70 = years later. The smile is exactly the same.